NCAR's Climate Data Guide (CDG) provides more information. A .BIL extension means 'Band-Interleaved-Format". This is a 'flat' binary file containing numeric values. The size (number of values) is NBANDS x NROWS x NCOLS. NCL's fbindirread and cbinread can be used to read these files. 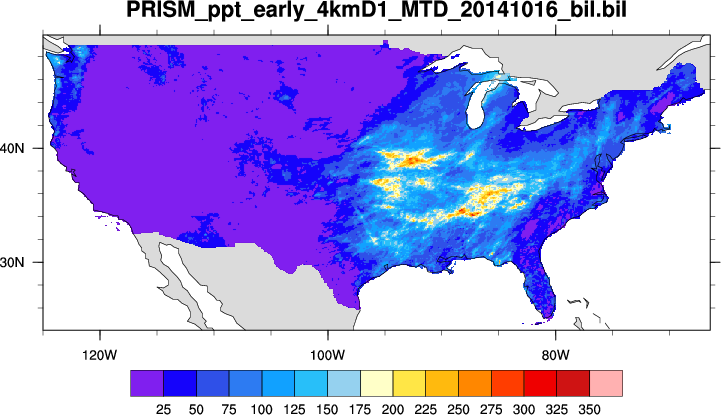 Please acknowledge and use of the data with an acknowledgement such as "Prism data provided by the NOAA/OAR/ESRL PSD, Boulder, Colorado, USA, from their Web site at http://www.esrl.noaa.gov/psd/". prism_1.ncl: A simple read (here, fbindirread) and plot of a binary file. Details about the file are included in the script documentation.